Don’t Tap the White Tile - the game that's taking over the Play Store! Hey remember that game we saw presented at the Google I/O? Oh, you didn’t watch it? No problem, we’ve got all the best bits highlighted in our Android 5.0 Lollipop features article. For those who did watch the Google I/O conference, you may have noticed one of the Google developers playing the conveniently named smash hit Don’t Tap the White Tile, and boy is it awesome. 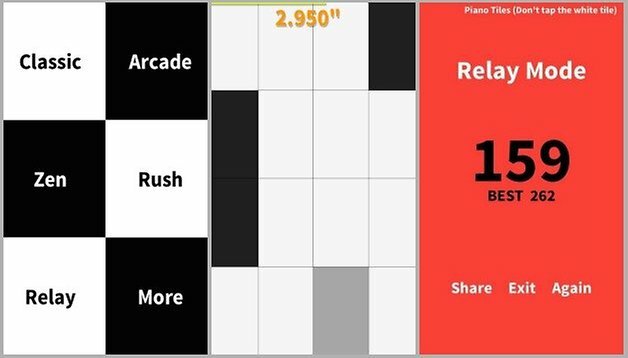 In Don’t Touch the White Tile or (or Piano Tiles as it's known on iOS), you tap black tiles on a scrolling keyboard while avoiding white tiles. It’s the latest in a line of low-fi, easy to pick up and play games in the same vein as Flappy Bird, and it’s just as addicting. There are a variety of different game modes, but the premise is always the same, and it’s a whole lot of fun. Here are the high scores I got while playing it on our LG G3. There are no in-app purchases, though you will have to suffer some adverts, but I highly recommend you download it. Think you can do better than me? Head over to the AndroidPIT forum and show us your highscores! I don't think it's just you, there isn't much to it really, it's just a dirty little screen tapper like Flappy Bird. my fingers are moving faster than light .little secret play the game in landscape mode. ya, I am your worst nightmare... beat me.. I played this game and maybe it is just me, but I couldn't get into it! How on earth have you done this??????!!! I need to change the app so that it is possible to click links in comments! Very annoying! Just a suggestion: you can try to add an option to view who gave our comment a thumbs up/ down. Currently only the number is shown.